Ash Wednesday is the first day of the Lenten season. The priest makes the sign of the cross of the forehead with the ashes from the previous Palm Sunday from the year before. 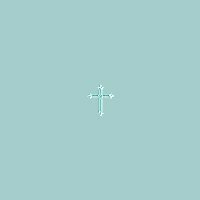 This symbolises that we are to commence to be faithful observe traditions and penance in a mark of respect of Jesus suffering for our sins and dying on the Cross. 'thou art dust and unto dust shalt return' Early history had the penitents coming with the old sackcloth clothes to the priest. this is the Sunday before Easter. Jesus entered into Jerusalem and the people held palms over his head as he walked. The town was crowed with his followers who came to commence the Jewish Passover. They cheered as he walked the road. 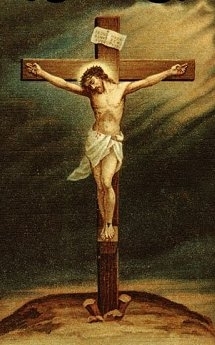 This day is know as maybe God's Friday when Christ died for our sins, thus giving us good. Christian see this as Good Friday to make it stand out from all other Fridays.. Jesus was crucified to bring us to Salvation to free us from 'Original Sin'. So Good does comes of this day of tragedy. 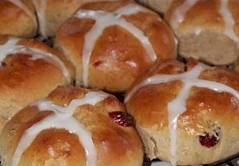 Buns were said to be part of a part of a Pagan ritual of eating them on Good Friday. Boun, and old description of the sacred ox. that was sacrificed during the vernal equinox with the horn of the beast stamped on the buns and were then eaten. The round bun is aid to be symbolising the the full moon with four quarters. The horn marked on the buns also are seen as the sign of the Cross. I t can be broken up into four parts easily and eaten when the folk returned from Mass. This represents new life following death and the resurrection. The egg looks unmeaning but from it emerges new life the chick. So from death and the grave we will rise to a new life. From early times this represents the sign of great fertility and immortality. Basket of eggs were let at thee burial sites of Ancient Greek and Romans. Eggs are left also by the Maoris in the hand of the dead. Jewish folk are served eggs when they return from the funerals of the death of their loved ones. As the Easter in the Northern Hemisphere is in the Spring season, it is nature and out of the cold dark times a new life emerges. On Easter Sunday when eggs are eaten today we can now see why the Easter eggs can be eaten after observing the eggs removed from the diet during Lent. Eggs were originally painted bright red, for joy, the colour of our blood. Reminding us that Jesus shed his blood for us all to be free from sin. Simon of Cyrene a Jerusalem egg merchant gave a basket of eggs in sorrow for Jesus being crucified. Simon went with Jesus to Calvary placing his basket down and returned to find they had all changed colour. The Polish believe that the eggs brightly painted gave Jesus some joy whilst a child. Mary painted them for him. When it was realised that the eggs would carry the symbolic effect of Jesus resurrection that his was the custom of the Easter Egg were only to be eaten at Easter. We can just imagine the bunnies jumping around the meadows in the Spring. However he was alas a Hare. Eostre sacred animal said to have been born with their eyes open. The hare represents the full moon and the feast of the Goddess..
We all know how prolific breeder they are and thus we see fertility and lots of new life. Bunnies have long been the fun of children at Easter. The bunny's name is 'tale of a tail' Bun being another word used as tail. thus bunny with its little short tail.